I am a child of the 80's. I have loved Care Bears my entire life. I still have some of the original plushies so I have been able to spread that down to my daughter and her love of their new show helps her love for them grow. For nearly 40 years, Precious Moments has been creating gifts that celebrate caring, sharing, and love. Precious Moments wants to share the care with their Care Bears line. Celebrate with everyone’s favorite bears from Care-A-Lot! 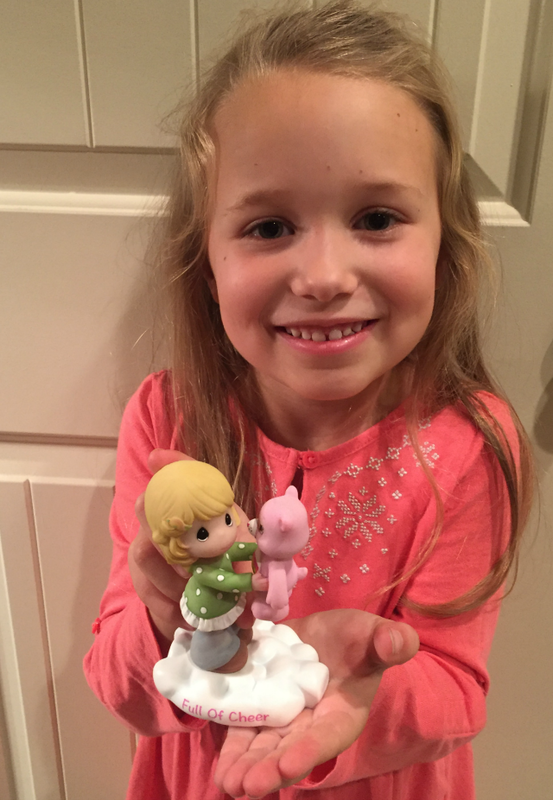 We have so many figurines from Precious Moments and they never cease to amaze. We are loving this new collection. Share the day with this sweet little one and Harmony Bear™. Makes a great gift for someone that loves you just the way you are! I love the message that Harmony Bear spreads and thought this would make a perfect addition to my daughter's Precious Moments figurine collection. Available on Amazon. Sweet polka dots and a rainbow hair-pin complete this cheerful picture of a little girl who is thrilled to be sharing her day with Cheer Bear™. Send some cheer to your favorite friend and share the gift of love. My daughter loves pink and is so FULL of cheer. She loved Cheer Bear from the moment she saw her. Each figurine will light up any Care Bear fan's day. Such a great gift idea for birthday, Christmas, or even to fill those Easter baskets. What I love about the Care Bears are their unique abilities to see the joy and kindness in life. And I think that's what we all need right now. These Care Bear figurines are available at Carlton Card stores and Amazon. An make sure to follow Precious Moments on Facebook and Pinterest. What do you think of Care Bears? What do you think of Precious Moments? What do you think of these new figurines? I was a teenager in the early 80s, but I really liked Grumpy Bear, lol. I guess, as a teenager, grumpy described my mood. Omgosh both of these were SO popular when I was growing up!! I would love to own some of this collection for the nostalgia alone!! I always loved receiving Precious Moments figurines for gifts when I was younger. These gifts always seemed extra special to me. I love the Care Bears, too! What a great collaboration! I have always loved Care Bears. These are so cute!